According to ChemOrbis, spot prices for ethylene and propylene gained ground for another week in Europe as bullish expectations for March are seen boosting buying interest ahead of the upcoming monomer settlements. As a result of the firming trend in the spot monomer markets, sellers have already issued some increases on their downstream PP and PE offers, pushing their prices back to January levels. Spot ethylene prices climbed by €25/ton on an FD NWE basis at the end of last week on the back improved demand as well as firm spot naphtha costs which have risen over $40/ton since the beginning of the month. Players project increases from €50/ton to €100/ton for the March ethylene contracts which are seen attracting more buyers to the market. In the PE market, a few suppliers even hinted that they could seek larger hikes than the anticipated monomer gains considering tight supply for PE. 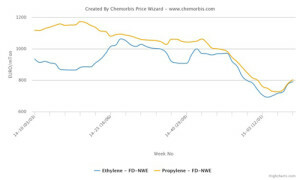 For propylene, spot prices gained ground for a third consecutive week and rose over €30/ton on an FD NWE basis as availability constraints remain in place. For the awaited March propylene contracts, expectations are calling for increases from €70/ton to €100/ton, according to ChemOrbis. In production news, Austria’s Borealis is expected to lift the force majeure on its 625,000 tons/year steam cracker in Stenungsund, Sweden in a week after restarting the cracker by the middle of February. The force majeure has been in place since January 30. In addition to Borealis’ force majeure, BASF Sonatrach PropanChem’s 350,000 tons/year propane dehydrogenation unit in Tarragona, Spain has been offline for maintenance since end January. Restart is slated for the first half of March. Total Petrochemicals is also planning to shut their Feyzin cracker in France for turnaround in early March. The cracker, which has an ethylene capacity of 250,000 tons/year, is expected to remain offline until the middle of April.